I have been living in outfits like these lately. 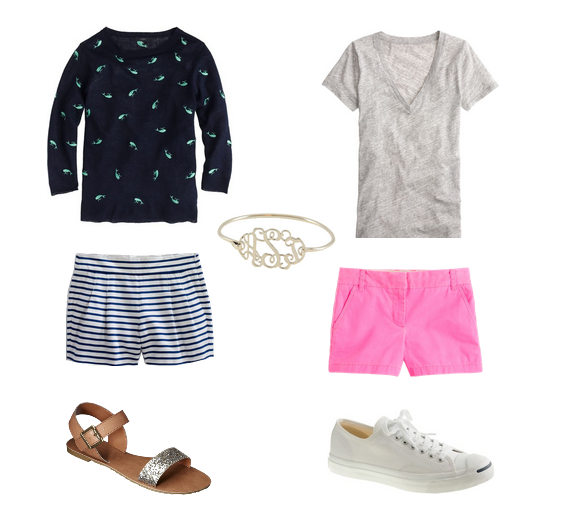 Super simple and easy to throw on for last minute trips to the mall, beach or ice cream shop! In a sense, these 2 outfits have become my summer uniform! The pink chinos are such a staple and I literally cannot take off those striped shorts (mine are from Gap) and the whale sweater. Total impulse buys but really worth it! BTW, I just put those white tennies in my shopping cart and am super excited to wear them all summer long! What pieces do you turn to a lot of those summer days? During the summer I always wear my Jack Rogers sandals! They always seem to go with anything!